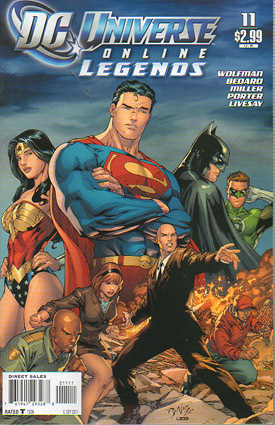 In a Lexcorp secret sub station in the suburbs of Metropolis, Lex Luthor reviews a video recording of Superman's failure at the incident with Toyman and The Prankster from last issue. Luthor relishes Superman's inadequacies and sense of loss while explaining to Mercy that his plan is working perfectly. Soon the public will begin to doubt their Man of Steel and then doubt will turn to fear, followed by hatred. Mercy reports that Brainiac's exobytes have infected small pockets of the population granting people superhuman abilities, such as a rapper named Alec Lincoln who has exhibited the power of super speed like The Flash. Also mother of two, Cindy Fairfax has become a shapeshifter, EMP Jonathan MacArthur is now a spellcaster, and Daily Planet mailroom worker Carmen Figueroa has super-strength. Luthor states that his plan is to play the middle between Brainiac and Superman to ensure the greatness of the human race. Mercy notices an incoming call from Brainiac and hopes that he hasn't been listening in on their conversation. Brainiac tells Lex that all is going to plan and the time has come to execute the next phase. Lex contacts the four fledgling heroes and offers to help them use their powers more effectively as a new team. They all agree, so later he hosts a massive press conference to announce them. They are called: Luthor's Legion. In the Batcave, the Justice League watches while Batman explains that even though they all know that Luthor's a villain, that much of the world still sees him as a brilliant philanthropist. Green Lantern uses his power ring to extract The Atom from Superman's insides. Atom reports that he indeed saw traces of Brainiac's exobyte extrusions inside Superman's body and will begin testing what he was able to remove. Superman realizes that this is all a ploy to gain total control over him and that he is now a danger to the League and the people of Earth. Before anyone can argue with him, he takes off. Meanwhile in Metropolis, Luthor's Legion take on Brainiac's enforcers and show the world what they're capable of and how effective Luthor's "real" heroes can be. Lex reminds viewers that the Justice League failed to protect Earth and its citizens, so now it's time for the citizens to rise up and show the world what ordinary humans can do to save themselves. Later, Superman finds Lois atop their apartment building's roof, huddled at the ledge in a long coat. He begins to explain to her that Brainiac may have found a way to control him and that he's going to have to leave before someone gets hurt. Lois turns around and shows that her skin has changed to look like exposed pink muscle and she exhibits electrical powers. She also tells him that Perry and Jimmy have powers now as well, as do the rest of the people who were in the Daily Planet building when Brainiac stole it. Despite her discomfort, Lois tells Superman that she feels better than she ever has in her life, but she's still scared. Superman hugs her and tells her they're in this together before passionately kissing her. Unfortunately, neither of them realize that they're being watched by Lexcorp because Luthor wanted all the Daily Planet staff monitored. Mercy forwards the video to Lex who realizes that either Lois Lane is having an affair, or more likely Superman is Clark Kent. Story - 5: So much to talk about. We're eleven issues in now and even though this is still a cooling-down part of the story, it's still poignant. Luthor's a genius and we should expect him to have a master plan. And so far, this one is playing out nicely and remains very interesting. We're still in the world that will one day become the future that older Lex is trying to change in the story of the game, so this remains a very good prologue to the next big phase of the series. Luthor's arguments about how the world's superheroes are flawed is certainly sound, which is why I can buy into the thought that the people of the world would be on his side. These new heroes in Luthor's Legion are every day people who want to do the right thing. More often than not in comics, they would have become villains, but I suspect that's something that will be explored soon. Art - 5: The drawing and inking are outstanding once again. Everything from Mercy's Japanese style dress in the first few pages to the League in the Batcave and Luthor's Legion look outstanding. Also, even though I'm not the biggest fan of Plastic Man, the artist clearly had a good time changing him frenetically from one panel to the next in the Batcave scene. The art certainly complimented the writing, and that's the best comic readers can ask for. Everything from up close bodies and faces to backgrounds look great. I actually wish Mike S. Miller would be the regular artist, but I suspect the semi-monthly format is the only reason he isn't. Cover Art - 5: This might be my favorite cover of the series so far. The story of the issue raises the question: are superheroes flawed gods in the eyes of the citizens. The art here represents that beautifully by standing larger-than-life heroes in the upper background watching over Luthor and his crew of new everyman heroes. Plus I love that Superman is put in the forefront along with Batman, Wonder Woman and Green Lantern. All too often lately, he's been pushed to the back. Superman is still the first and greatest superhero and this is where he belongs.